inspiration | Communicate with meaning. About the day he just experienced. About the fears (appropriate and ill-founded) in his life. About the narrative going on, unspoken, in his head. About what he likes and what he dislikes. You’ll need to travel to this place of ‘right’ before you have any chance at all of actual communication. This is the synchronicity of the universe. This is the message I needed to hear today from Seth Godin, the author of 18 books that have been bestsellers around the world. Seth writes about the post-industrial revolution, the way ideas spread, marketing, and most of all, changing everything. You might be familiar with his books Linchpin, Tribes, The Dip and Purple Cow. And here’s a related blog post from Seth worth reading today, If not now, when? Embrace caring. Imagine what you can do through change. This week my nephew Capt. Derek Herrera retired from active duty with the Marines. He was awarded a Bronze Star for combat valor at his retirement ceremony at Camp Pendleton. He was accompanied by his wife Maura and service dog Shaggy. And he was walking even with a bullet lodged in his spine, thanks to the recently FDA-approved ReWalk robotic exoskeleton. Derek was wounded in Afghanistan in 2012 by a sniper’s bullet in the Helmand River Valley of southwestern Afghanistan leading his special operations team, paralyzed from the chest down. Today Derek is CEO of Ruckpack. RuckPack® is a concentrated liquid energy shot of essential vitamins and minerals, without caffeine. He is also completing his MBA from UCLA. Derek’s story is captured thoughtfully in this article by Gretel Kovach, U-T San Diego military affairs writer. Photo courtesy of U-T San Diego. Walking doesn’t seem so difficult – until you can’t. But today there’s hope. Incredible new technology is making a difference. See “Getting back on my feet,” my nephew’s life-changing story. 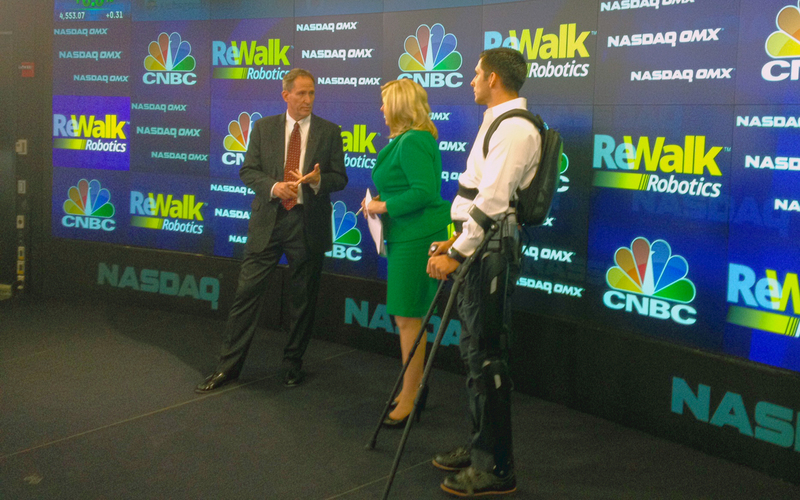 Help spread the word about ReWalk so others can experience the chance to walk again, too.